They say the smallest things are those that matter the most. Well, when it comes to fishing, those small things are a trusty pair of fishing pliers. Fishing pliers are a must have for all types of fishing. Essential for removing hooks, especially when the fish has gulped down your bait, when cutting braid or mono lines and adding or changing hooks on your lures. You need to get the best tool for the job. No worries; we are here to help you make that important choice. 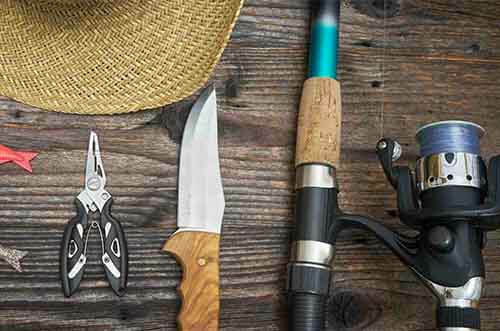 Best Fishing Pliers | Our Top 3. Here are our top three pliers that you should consider before your next trip out. Any fisherman will definitely be satisfied with how well the bite fishing pliers cut the strongest braided lines and the heaviest mono leader. Furthermore, the cuts are super clean. The manufacturers offer variations: you can go for the 7.5" blue or red, or opt for the 6.5" blue with a split ring nose. 100% corrosion free so great for both saltwater and freshwater fishing. Tip: the 6.5” is better suited for small handed people. It comes with a 5-year warranty which is not bad in the fishing-gear industry. The heat treated aluminium alloy makes these a super strong set of fishing pliers. Plus of course the easily replaceable black stainless steel jaws are a gift if you are using these all the time. Just like the Nighthawk marine pliers, they use easily replaceable tungsten carbide cutters that are sharp as razor blades, but can be swapped out when they dull. The anodized aluminum alloy makes this set of pliers 100% corrosion free. Be assured they are ideal for both harsh salty environments and fresh waters. It has soft touch grips moulded onto the handles which offer increased comfort and handling of the tool. There is no wobble in the grip. The handles are spring-loaded which allows for single-hand use. The bite fishing pliers come with a few accessories. You get a rotating belt-clip nylon sheath that is extremely handy when it comes to keeping your pliers safe and in place. You also get a lanyard and caribiner clip. These are our recommended pliers for the best saltwater fishing pliers for the money. You might not like that there is no holder to keep the pliers shut when they are not in use. However, since there is a sheath, I find this particular con easy to live with. The handles might also not work well for small handed people. They call them splizzors because they almost resemble an ordinary pair of scissors. They might just be the longest pliers around with 8.5 inches but they are worth it-the long and narrow nose will definitely aid in deep hook removals. The Buck Splizzors uses Buck's Edge 2X technology-edge to edge pressure that is 10x greater than that in ordinary scissors. Micro serrations make splizzors extremely efficient when it comes to cutting braid. They cut braid like butter! I was surprised to find it cuts, trims, shears, bends, crimps and even remove hooks. The long nose ensure hook removal is a breeze. The manufacturers decided to move away from the aluminum alloy that most other manufacturers use and went with 420HC Stainless Steel. The results? A blade that is corrosion resistance but still easy to sharpen. Remember you can always replace the blades once they wear out. The dynaflex handle is extremely comfortable and designed for hours of prolonged use. A large soft grip keeps it firmly in your hands. And guess what? They are single-hand pliers. The splizzors are great multitaskers- two crimpers for both large and small split shots, a bottle opener and a lanyard hole. They didn't forget to add a heavy-duty nylon sheath. Buck offers a forever warranty which few companies seems to match. I really like the confidence they have in their products. They might be a bit stiff when they first come out of the box but a little oil will help with that. Or adjusting the screws just a bit. Icast 2016 dubbed the Boomerang Braid Snips "2016 best fishing accessory". They don't look like pliers or even scissors so at first I didn't think they should be in this list. But wait till you try to cut fishing line with it. The precision 420 stainless steel cutters worked on mono and braid beautifully with so much precision that there is no fraying. I didn’t even have to put any tension on the line when using it. Have you ever noticed the assortment of fishing gadgets hanging around the neck of pro fishermen. Chances are if you have then you will have spotted on of these little beauties. Hands down the best little tool for cutting braid. It has a 36" retractable cord that makes it ready for use 24/7. The chord is able to reach even the farthest places. The unique squeeze design is great and it sure provides a firm grip even with wet or gloved hands. The boomerang is one of the few fishing fliers that has a locking mechanism that makes it a great single-hand plier. It is compact enough to fit anywhere including your fishing trays and even your own shirt or trouser pockets. The light weight makes its storage and portability much easier compared to other fishing pliers. What makes it short of perfect? I don't like that they are not as durable in salt water as they are in fresh water. The internal springs are not salt resistant. The P-line Adaro pliers remove hooks easily and also work like a charm on both mono and braid lines. Sharpness and precision are near perfection. They weigh 5.4 ounces which may make them unsuitable for heavy duty jobs that traditional steel pliers can do but they are perfect for fishing. They are strong enough to cut through any braid easily. This model comes in four different colors –sliver, blue, red and gold. The one thing the manufacturers of this model really put effort in is durability. Its durability comes from the high strength corrosion proof aluminum. The jaws are also coated with a carbon steel tip and the line cutter is made from Tungsten Carbide. The steel jaws are of course replaceable; no need to buy a new set of pliers when they wear out. And of course, even the best fishing pliers wear out. The quality make makes it suitable for both fresh water and salty water fishing. These are the best aluminum fishing pliers on the market if you are on a budget. Pro tip: Rinsing the pliers off after using them in salty water will make them last longer. The hinge has a built-in spring to provide easy opening and closing of jaws. This easily makes it a one-hand pliers. I like the cordura pouch, nylon lanyard and holster (with a belt loop) that the fishing pliers come with. The big handles are unusable for small handed people and furthermore, they are not rubber coated. I love how the Manley pliers come in four different colors - red, silver, gold and blue. All bright enough colors to spot them in a crowded tool box. They look good but how well do they work? I think they are pretty good. The tungsten carbide makes them strong enough to handle cutting through thick lines. The cutters have a small nose making it easy for you to remove small hooks. This model has a unique side cutting mechanism instead of having to feed stuff into the jaws. Did you know you could even use them around the house and workbench? How handy is that? The grooves in the handle makes getting a firm, sturdy grip so easy. Forget about losing any more pliers overboard. The spring enables single-hand use so you don't have to use your both hands. These Manley pliers are not the lightest out there but they are relatively light making them easy to work with no strain. Just like most shipping fliers you get a free sheath plus a lanyard and holster so that you can attach it to clothing or your belt. Any downsides you need to know about? Most people also don't like that the handles open up wider than most pliers around. The handles are also not non slip. One of the coolest things the Piscifun fishing﻿ pliers have to offer is the widest variety of colors to choose from. This makes it great when selecting it as a gift for some else; you can easily get them their favorite color. However, they are not all beauty with no brawn. They work great on mono and braided line with a crisp, clean cut. The split ring opener on the jaws makes replacing hooks a breeze. The materials they are made from are quality-from the machine-cut aluminum handles, the replaceable tungsten carbide cutters to the titanium coated stainless steel jaws. What this means is that they can handle both fresh water and salt water fishing. These pliers are significantly durable because they use aircraft grade aluminum that is anodized to keep corrosion at bay. It is incredibly easy to use because of an ergonomic handle that is comfortable to use plus the aluminum makes the little gadget light enough (a little over 3 ounces) providing no strain. The split ring design provides easy removal from a lure or hook eye. The manufacturers add in a belt loop clasp, a coil lanyard and a woven nylon sheath just to make your life a little (or a lot) easier. With this there is less risk of misplacing your pliers or having them drop into the water. The case has a quick release clip if you need to use it further than the cord reaches. I love the 30-day money back guarantee they offer. What does this mean for you? There is no risk if you buy the product; you are allowed to return it if it doesn't work for you or suit your needs. The tips are too large for smaller split rings. They should also consider having a Velcro locker that is attached upwards making it easier to put the pliers back in the sleeve and lock them. They also do not recommend the pliers for big game fishing or cutting up metal things or else it won't last as last as long as it is supposed to. The Fishing Tree SST Pliers largely resemble the fishing tree AL model. The t6 heat treatments and cnc cutting is ideal for cutting light wires such as monofilament and nylon, and the toughest wires and any heavy duty crimping. The cuts are impeccable and clean. The rugged jaw tips grab and hold fish perfectly meaning you don't have to waste money on a special grip. The split ring tip is so tough and accurate that it even handles large size rings. If you are wondering about hook removal, this set of pliers work pretty okay when removing the hooks from the fish's mouth. It has an anodized covering that keeps rust at bay especially in those salty water environments. The fishing pliers work during both big game fishing and small time fishing which makes them all rounded. The pliers are small and light which makes them great for kayaks. There is no extra weight to make your fishing bag heavier than it should be. They have a new sleek design that looks very modern. The small finger indentations on the handles provide a firm grip and soft touch. Good thing is that whether you are small handed or large handed, the handles will suit you perfectly. This set of fishing pliers comes with a sheath for easy and safe storage. The highly elastic lanyard with a caribiner adds a nice touch to it all. I was a little over excited when I discovered they have a lifetime guarantee. This means no risk at all. They will refund or replace in case of any issues. The only downside is that it is a bit difficult to find these fishing pliers in the market. I had to run around a couple of stores before I found one that had what I needed. The 7” Berkley Aluminium Fishing Pliers are a top quality piece of kit at very reasonable money. The replaceable carbide blades are perfect for cutting through mono or braided line. Razor sharp straight out of the pack and the beauty of this style of blade is you can replace them when they get too dull to do the job. There are a multitude of crimping setups on the jaws of the pliers - perfect for setting up jigs when at your favourite swim. The main body of the pliers is made from anodised aluminium and they have corrosion resistant stainless inserts. Just make sure to give them a wipe after each session to keep them in tip top condition. What materials are the pliers made from? The design is good but be careful not to get a set of pliers that is all beauty with no brawn; pliers that look good but are a piece of junk. A set of pliers made from quality materials is both strong and durable. You especially need corrosion resistant materials because of the extremely humid conditions and salty water. Look for pliers that make use of stainless steel and non-corrosive alloys such as aluminum and titanium. I know what you are thinking, why is how it looks like a top priority? Because the design determines how easy and comfy it is to use. You need to look at the handles. Are they ergonomic enough? Can they provide a firm grip even with wet or gloved hands? Flat handles are excellent at sliding off your hands. What is the nose length? For larger, toothier fish, get the long nosed pliers and vice versa for small fish. A great pair of pliers should handle tasks like cutting mono or braid, removing a stubborn hook as well as rigging lures, leaders and baits. Such pliers are perfect but they can also be very expensive. Many of the affordable pliers in the market perform some of these tasks better than others and so you should get a pair that does what you need best, for example if you mainly cut fishing lines get fishing pliers that can cut neat and clean. If you are a professional fisherman or angler investing in a quality expensive is no big deal. However, if you only fish once in a blue moon, why waste so much money and yet there are many relatively affordable models that can serve you well? If the pliers are versatile enough to use around the house, spend the money if you have it! If however you are on a tight budget, get a good set of fishing pliers with as few downsides as possible or downsides you can live with. Pliers with many accessories especially lanyards for attaching are very handy. These are what will keep your pliers from falling into the water. A split ring tool is also a bonus feature on some that is a lifesaver when it comes to changing or replacing treble hooks. 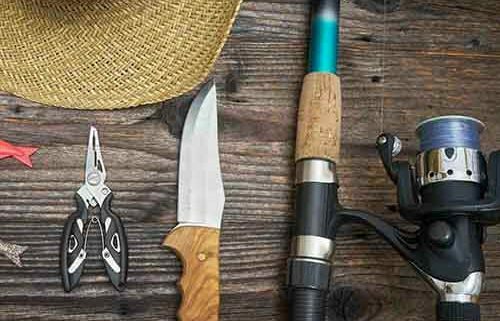 The best fishing pliers for you is definitely a personal choice. When you take the myriad of features into account and the varying prices you could research all day and still end up with nothing. In this review we picked out choice of the best fishing pliers that we would use in an effort to help you make that all important decision. If you wanted a great all rounder then go for the Buck Splizzors or if it's just a very handy line cutter then go for the Boomerang.